One of the unfortunate realities of heart valve surgery is the possibility of a re-operation. Patients may need a re-operation due to valve device failure, post-operative issues relating to heart valve repair or the progression of valve disease. To learn more about heart valve re-operations, I recently met with Dr. Anelechi Anyanwu, MD. So you know, Dr. Anyanwu specializes in complex, heart valve re-operations at Mount Sinai Medical Center in New York City. The highlights of our discussion are provided in this video interview. For the hearing impaired members of our community, I have provided a written transcript below. While re-operations may be part of a patient’s long-term treatment of valve therapy, I know that if my own heart valve replacements should fail in the future… I’d prefer having another operation compared to the fatal alternative. Many thanks to Dr. Anelechi Anyanwu for sharing his clinical experience and research with our patient and caregiver community. 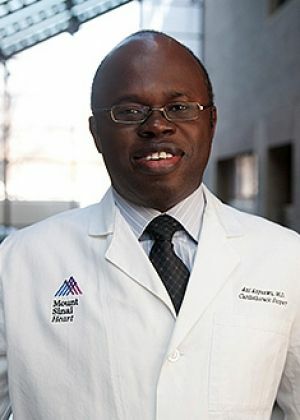 Adam: Hi everybody, it is Adam of Heart Valve Surgery.com and I am thrilled to be here with Dr. Anelechi Anyanwu from the Mount Sinai Medical Center in New York, NY. He is a cardiac surgeon there. Dr. Anyanwu thanks for being with us and you’ve performed surgery on many patients out there including Bob DeVoss so thanks for your help with that. And I got a question. What type of cardiac surgery do you specialized in at Mt. Sinai? Dr. Anyanwu: I specialized in three three main things. The first is complex mitral valve repair. The second is heart valve re-operations so we operate our patients who have had surgery and lead them on our operations for the valve. And the third is ventricular assist devices on heart transplantations. And those are the core that I specialized in. Adam: Specific to your second specialty which is the re-operations and I know a lot of patients out there they don’t think that far ahead. In the process most people are first time valve surgery patients and I guess the big question for them is, is that common? Doctor Anyanwu: It is relatively common. It is common for the reason that valve surgery is now very widely practiced and very successful. So if you look at the common types of valve surgery which is valve repair and valve replacement — for every hundred patient who have valve repair something like 1 or 2% would need another re-operation. It can happen a year after surgery, 10 years after, 20 years after every year there is some set of patients that need re-operations. Most young patients with need re-operations in their lifetime because in some point because somewhere around 10 to 15 years after surgical valve will break out and start leaking. If you have a mechanical valve a metal valve there’s also some re-operations because of clots of the valve or infections and the other issue of mitral valve repair cause more and more surgeons are doing mitral valve repair the level of skill and expertise is very variable. So as surgeons climb through their learning curve a lot of this valve repairs will fail. And, as you get better you have fewer failures so the growing area which we specializing is having to re-repair valves so valves whose surgeons have done a repair the repair as failed either months or years later and then we repair as a second time so there is a growing cohort of patients that need re-operations. Adam: In the re-operation process I am curious to note is that a more complex procedure than a first time valve surgery? Dr. Anelechi Anyanwu: Yes, it is more complicated because there is essentially two operations within a re-operation. The first is just getting back to the chest is an operation in itself for the surgeon because each time your body is cut it heals by scarring in the same way you have a scar in your skin. If you have surgery the hole inside of your chest is a big scar. So getting back in safely into the scar without enduring the heart or injuring your blood vessel or bypass. If the patient has any bypass there’s a big operation and requires a lot of planning and different techniques to get in safely. And once that’s have been accomplished we are operating on the valve itself it is operating anew. Adam: And I’m thinking why your complex and I think of the team that’s needed to do this. I imagine that you have your team but if you ever have a situation where you’re with another surgeon doing this complex re-operations? Dr. Anyanwu: The bulk of the complex valve what we do we have two surgeons on the team. And the way we look at it is that two pairs of eyes are better than one. Two pairs of hands are better than one. And it’s like if you’re flying you know a small turbo prop plane with a single probably you can fly with one pilot. Think of flying a 747 airplane across the Pacific — you have 2 or 3 pilots and I think it’s the same analogy we feel it requires. There is a lot of decision-making and also a lot of technical surgery to be done — so, we have two surgeons — two experienced valve surgeons — working on the same page at one time. Adam: Thank you so much for sharing your expertise today with us and all the good work that you actually doing out there in your clinic we really appreciate it. Thanks for your ongoing pursuit of healthy hearts. Thanks for stopping by today. I would be interested in knowing more about the process of Cardioplegia and how surgeons know for certain that they have achieved proper arrest of the heart prior to operating. I understand that acupunture can help lots of problems. 3 months after heart valve surgery, never having had any fast heart rate in 50 years. I had minimal invasive mitral valve replacement surgery in 2007. Two years later it started leaking. I was really upset because I felt like I was back to square one. I hold my breath every time I have an echo in fear that I’ll be facing surgery again. Will the surgery be more or less difficult because my first surgery was minimum invasive? Thanks for all your support & information. Thank you for all your help in bringing top doctors to interview on important subjects. . I am facing a reoperation soon on a bovine aortic valve, and this was valuable information.